When I was diagnosed with Ankylosing Spondylitis over a decade ago, I didn’t know what to think. I use a wheelchair to help conserve energy. Once I hit 3,000 steps, I stop walking and rely on my chair to do the rest of the work for me. No one told me what to expect. At first things were slow going. I had a year that was really bad, but once the medications kicked in about six months after my diagnosis, my quality of life improved for a few years. I was back on my feet and running again and I didn’t have to use my cane. Those were the good days. Then it got worse again. Things progressed quickly in July 2014, and I found myself being house-bound more and more often. It didn’t take me long to see the big picture – what the rest of my life would look like. Suddenly I realized that sports were no longer an option. Without sports, where could I turn to relieve my stress and anxiety about being sick all the time? At first I locked myself away with bitterness, but subconsciously, my head was already searching out things to use for that other side of me that my family will tell you has been there since I was a child. I’ve always been an artist. Music and art are great passions, so when I was done grieving for what I had lost, I turned to my love for art. Art is where I redirected my focus and all my attention in an effort to alleviate some of the stress and heartache I was going through with these diseases. I dabbled in Chinese water color painting when I lived in China. They may have robbed me of my abilities to run or dance the way I used to, but my artistic side, which has sustained me through childhood, has always been there and it was ripe for picking. This is where the answer to building strength and resilience was found in dark days of sickness. I relied on art for a pick me up. I could express my feelings and emotions through art. The best part about this is that I have many outlets for art, and I can always find something to do to fill a flare day. Writing and creating art allows me to cope with my pain and it distracts me from what is happening with my body. The pain is still present, but the process of creating overrules the signals that my body is sending to my brain. Music – I was classically trained as a child and I was once a professional singer. I’ve done album work, radio work, and I’ve sung on stage with bands all across China. Although chronic illness has affected my voice to an extent, I still love to sing. On days when I don’t have chest wall swelling, I love to sing. Here is a song I did a few years ago with a full band. We only rehearsed once. That was the last time I was able to get up on stage and move a bit. Painting – Water color and rock painting (See above for a painting I did in 2003 using Chinese water color techniques. I painted these rocks when I was going through a terrible bout of grief. The back of each rock has the reasons why I was grieving at the tiDIY projects like hooking, embroidery and cross-stitch – I still do fine handwork when my hands allow me to do so. Jewelry – I’m been making jewelry for over 20 years. Many of my readers probably don’t know that I worked in the jewelry industry for many years. I made enough money from my jewelry sales and in my artisan’s group in Lanark Valley to move to China. I still make jewelry when my hands are ok and allow me to work in fine detail. Coloring – I got into coloring simply because it’s a mindless activity that helps distract me from pain. I’m on my 13th flare book and I do a video for each one. Each book represents 3-4 months of flare activity. Flower arranging – These days, I do a lot of flower arranging. I like the idea of working with living art by creating Japanese flower arrangements that change each day. This form of art has been in my family on my mother’s side for many years, passed down from my grandmother to my mother and finally to me. Journaling – The stacks of journals at home in my parents’ basement and the journals I have from my travels through Asia tell some interesting tales. Green Bracelet in Venetian glass and malachite for protection. Green always makes me feel a little better. It’s a color I can get lost in. From a lighting photography class in 2010. Anything I can find on Pinterest that looks intriguing. Doctors characterize chronic pain as acute pain that lasts three months or longer. Usually, pain starts with an injury or surgery or from a medical condition, such as Ankylosing Spondylitis or Fibromyalgia. Pain can present in many forms from mild to severe and from dull aches to burning pain. It can come and go or it can stay with you and hammer away at your body for weeks at a time. Pain can wear you down to nothing. It affects everything: your body, your mood, every physical, emotional and mental aspect of your daily life is affected by pain. You can read more about my entries on chronic pain here. Here is an example of a coloring book that I call FLARE BOOKS for Chronic Illness. This was my 10th FLARE BOOK. Each book represents 2-4 months of flare activity. This was a special book to color because it was written and designed by one of my favorite authors, Jenny Lawson. It’s called You Are Here, and it’s about chronic illness. It was a huge source of support for me when I was working on this book. Art therapy – or as I like to tag it in my Instagram feed – ‘art for arthritis‘ or ‘art for chronic illness‘, is a secondary health approach that combines artwork and creativity by patients. It helps patients to cope with the enormity of what is happening to them, allows them to express their emotions or pain, and helps patients by distracting them from pain, which allows them to cope with their daily challenges with chronic illness. I painted these rocks when I was going through a terrible bout of grief. The back of each rock has the reasons why I was grieving at the time. I am not a qualified health practitioner and although I’ve read that art therapy can be a guided part of dealing with illness, for myself, I use it for mental health, distraction, and it is a great mind and body technique that helps immensely with chronic pain. There are days we might not be able to do much, but the satisfaction of creating something always creates some joy and happiness. An additional benefit to doing art therapy is for its use in allowing chronic pain sufferers to show their pain through art, whether it’s drawing, painting, sculpting or stitching. One of the most famous artists of our time, Frida Kahlo from Mexico, was well known for showing her pain through her artwork. A quick glance at just a few of her paintings lets the viewer know what she was dealing with on a day to day basis. 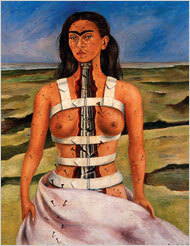 Kahlo suffered from Fibromyalgia and she had lifelong pain from being in an accident as a teenager. The accident left her pelvis and spine shattered. She underwent numerous operations, sadly she had several miscarriages, and she was often encased in metalwork. If you’ve never seen Frida Kahlo in bed painting, I urge you to google this image. Throughout her horrific injuries and for the rest of her years, she lived in horrible pain and she channeled all of it into her artwork. Pain can’t be seen and thus it is almost impossible to measure and assess. You can’t see pain, so there is no way to really speak about it. I called this ikebana arrangement A HOT MESS because it demonstrates how I was feeling the day that I made it. I had a fever, my body was burning with pain, and my legs were full of inflammation. This came out beautifully and the colors represent how I felt that day. Art for arthritis or art therapy helps on the really bad days that I am housebound with nothing to do. Words can be empty, but artwork aptly illustrates the rage, sorrow, and grief that many patients go through daily. Art elicits an emotional response from viewers. No words are necessary. Many people have experienced acute pain, but most people do not understand what it is like to live with chronic pain on a permanent basis or how it affects people mentally and physically. Creating art can often stave off feelings of worthlessness and it helps the patient to fight against the loss of losing their quality of life. 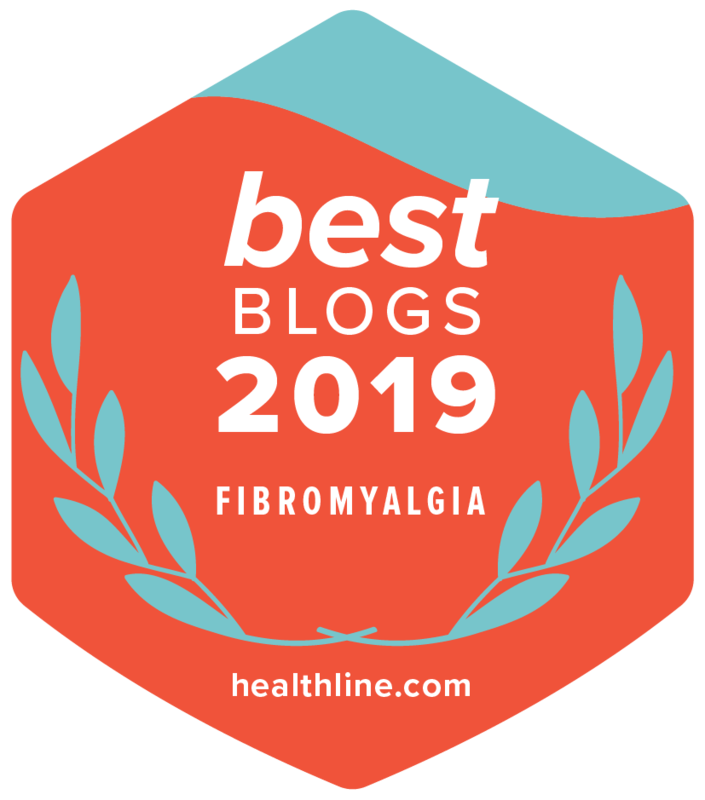 We can learn more about the process of coming to terms with pain through art, especially in terms of losing your identity to pain, redefining yourself, identifying with other people, and remaining hopeful on your journey through chronic illness. Even the simple act of drawing pain in your body can be helpful by allowing other people to understand how you feel. Reds and oranges can illustrate heat or burning sensations, while blues and grays can recreate how your legs feel when they go numb or it can illustrate your mood that day. I started off my rock paintings as a representation of my chronic pain. Then I moved to Ikebana and flower arranging and I found that even more satisfying. In the red and yellow arrangement above, I added a bring red Wang Peony to illustrate the throbbing of my heart, chest and body. Then I added yellow freesia to illustrate the fire and inflammation burning through my body. The black bowl at the bottom shows that I was surrounded in darkness that day. Overall, this piece showed anger and I illustrated my anger in colors of red and yellow to show my emotions. When I completed this arrangement, I felt a brief hot flash of sadness, but then I felt strong and empowered. I knew then that I could take any emotion and channel it into something that validated how I was feeling, but I also had the power of turning that negative emotion into something bright and beautiful. I can also use this arrangement to say that this is what my pain looks like and this is how I was feeling that day. The sharp spikes of the green leaves and the yellow freesia going every way illustrate that this is pain coursing through my body, hot, stabbing, and fierce. Being able to illustrate this in a visual way made me feel that my pain was more real. I can now use this ikebana arrangement as an advocacy tool or for teaching how to evoke emotions in something as simple as a flower arrangement. Do I Need To Take An Art Class to Begin Art Therapy? You do not need to be an artist to do art therapy. Artistic ability has nothing to do with art therapy. This is a process you can do on your own and feel good about, as long as you stay open to trying to create expressive pieces of artwork. Art, as mentioned above, can also bring other emotions to the surface and these emotions can be noted and discussed with your therapist during your next session. Art can also help you to feel ready and feel supported about your feelings and emotions. It’s a powerful tool for communication and self expression and it ultimately helps with improving physical, emotional and mental states of people of all ages. Art therapy for arthritis. A simple blue bouquet for AS awareness. Blue is our awareness color, but the color also expressed my mood that day – depression was hitting me hard and I chose to resolve it by making something beautiful. You don’t need to take a class to get started unless you’re interested in going to class. Art can be done at home or it can be done in class – but the bottom line is that the ultimate goal of your artwork should be to help you be more relaxed, calm, and creative. Art allows you to change what is in the picture and it is an empowering tool that helps us build on self-confidence, strength, and resilience while managing pain. Art projects, no matter what form of art you choose, whether it’s writing, sketching, knitting, pottery making or anything else, can help release stress. I’ve found that when I am focused on my art, I’m less focused on my pain and more focused on the creative process. Raising awareness by sharing the art of chronic pain is something we should all try, whether it’s good or not. I hope it brings you some joy and some inspiration to be creative and let your pain go for a while. Stay tuned, because I have a new series coming up on artists that are doing art therapy for chronic illness, and you’re going to LOVE my first artist! She’s a very talented woman who has been creating art to illustrate her pain for many years and she’s one of the greatest gals I know. Marveling at the beauty of art. Splurging on nature in my home through the art of ikebana. Continuing on my creative journey. Balancing my life with projects I can do at home when I’m housebound. Investing in my future with art by using it as a tool to assist me when I’m in pain. Every girl needs to feel like a Queen every once in a while. I made this tiara for a charity event that we hosted with the Canadian Chamber of Commerce in Taiwan. I couldn’t dance that night, but I definitely had fun making this tiara for my hair.